צבע שמן שתוכנן במיוחד לגימור דגמים. הצבע מדולל לצביעה ישירות מהמיכל, ללא צורך בדילול נוסף. מכחול איכותי מוצמד למכסה המיכל. המיכל מתוכנן כך שהמכחול מוציא את הכמות האופטימלית הנחוצה לצביעה. OILBRUSHER contains high quality oil paint specifically formulated for modeling use, diluted to the perfect consistency to be applied straight from the jar. The cap has an exclusive built-in high-precision brush to apply the color directly onto your model, without having to put the oil paint on a palette or a piece of cardboard. This evolution prevents the oil from drying out and wasting product unnecessarily. Furthermore, the modern container includes a dispenser-cleaner system that removes the excess paint from the brush, leaving just the right amount in the tip. Traditional oil paint tubes were messy to use and difficult to open when the oil paint dries around the cap causing it to become stuck. This doesn´t happen with the OILBRUSHER, it is always clean and always stable. 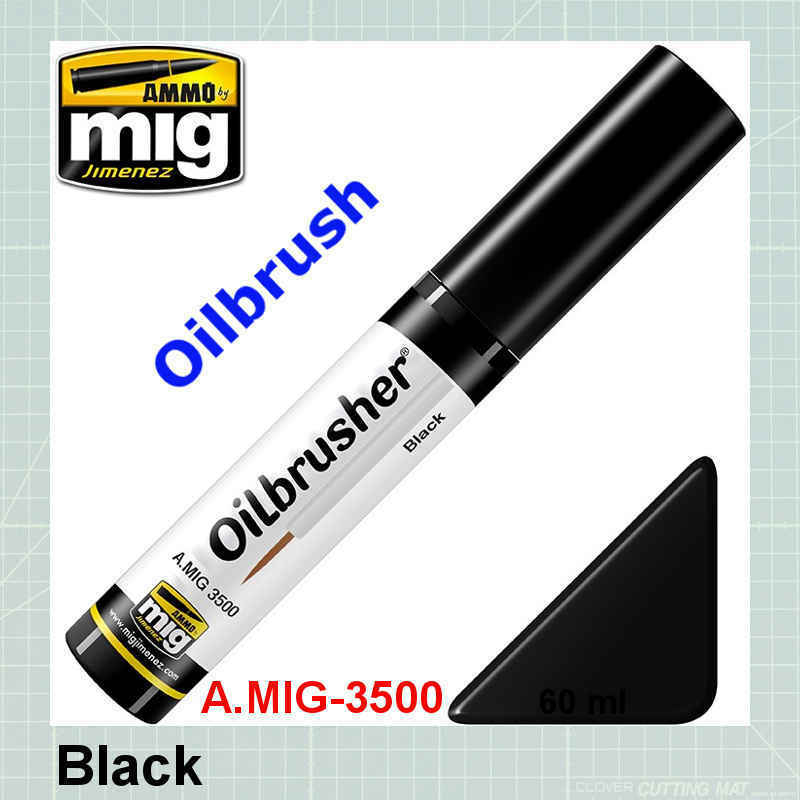 Besides all of these advantages, this revolutionary design also saves product and cost in the long run, particularly when considering OILBRUSHER is less expensive than traditional oil paints in the market. 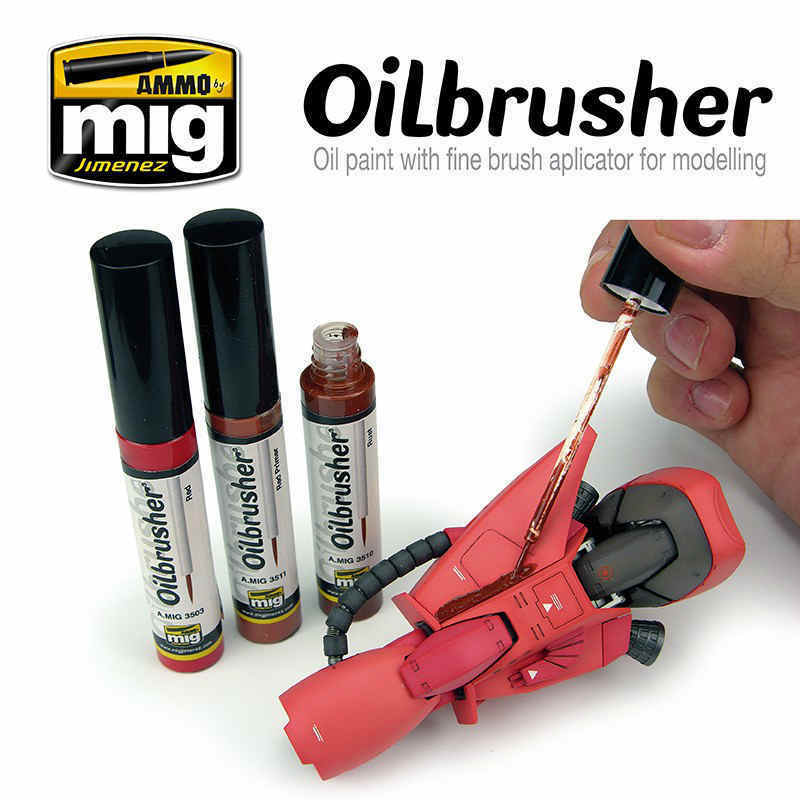 The OILBRUSHER color range includes the most common shades used in scale models, avoiding unnecessary tones that would remain otherwise mostly unused on the bench. Painting with oils has never been so fun and simple. 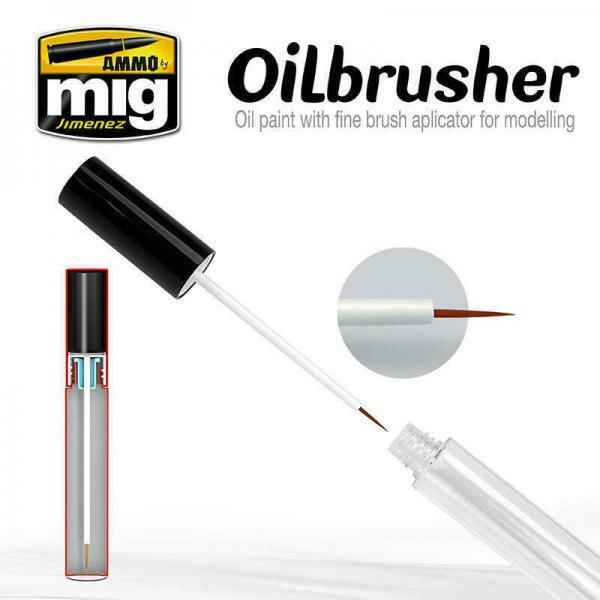 OILBRUSHER is your oil paint with built-in applicator brush; a unique and exclusive AMMO product.